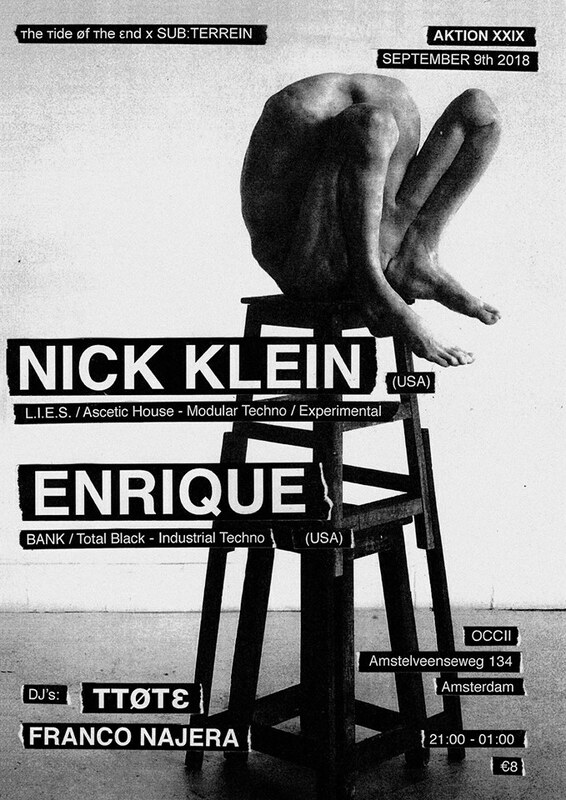 Originally from south Florida, Nick Klein is an experimental techno producer now based in New York City, where he co-runs left-field label Primitive Languages with Miguel Enrique Alvariño. Over the past years he has delved deep into industrial, noise, techno and lo-fi recording techniques. Like many of his contemporaries in Brooklyn’s burgeoning techno scene, he approaches his productions with a similar flair for the ominous, freakier sides of dance music, with releases on notable labels including L.I.E.S., Alter, Ascetic House, Unknown Precept, and Bank NYC. Miguel Alvarino, aka Enrique, is among a new breed of musicians that have been popping-up in and around Brooklyn over past few years. He’s pushing forward his own brand of techno by way of his noise roots. Packed with Anxiety tinged bass drums, frenetic instrumentation, and little breathing room, Enrique’s livesets show a mastery of hybridity touching on industrial palettes with the use of proper rave pacing.